Enjoy a series of concerts by innovative up-and-coming musicians at the Berklee College of Music, March 21-25. The Stave Sessions, part of the Celebrity Series of Boston, highlight the experimental and often non-conforming styles of contemporary musicians who take diverse approaches to their music. Don’t miss performances by rising tenor sax star Melissa Aldana, the first woman to win the Thelonious Monk International Jazz Saxophone competition; Darcy James Argue and his 18-piece big band, the Secret Society, which has earned Grammy nominations; and Innov Gnawa, which performs hypnotic chants with string and percussion instruments. Shows take place at an intimate venue at 160 Massachusetts Ave., which offers an urban backdrop and upscale vibe. Tickets: $25 advance, $30 at show, $10 students. www.stavesessions.org. Throw on ski gear, shorts, a costume, or your favorite Hawaiian shirt and try pond skimming at several New Hampshire resorts. Skiers and snowboarders try to cross a pond at the base of each mountain and see who can go the farthest or make the biggest splash. Leave the ski poles at home, but consider bringing your favorite snorkel (suggested, not required). Pond skimming takes place at Black Mountain on March 25 (1 p.m.), King Pine on March 26 (1 p.m.), and Attitash on April 1 (12-1 p.m.). Participants must be 48 inches or taller for the Attitash event. All events are free, but a lift ticket is required to participate. Show up early to register and sign a waiver. www.blackmt.com, www.kingpine.com, www.attitash.com. Fly on Alaska Airlines and you can use three popular messaging apps for free en route to your destination. The airline’s Free Chat service lets you use Facebook Messenger, WhatsApp, and Apple’s iMessage from any smartphone on GoGo WiFi-equipped planes at no charge. Sign up for GoGo before takeoff. Alaska also launched a new Premium Class service on certain routes, giving passengers four inches of extra legroom, early boarding, and complimentary snacks and alcoholic drinks. Upgrade to Premium Class when booking, during check-in, or at the airport for anywhere from $15 to $79 on top of the base fare. www.alaskaair.com. Trying to gauge exactly when you should take off for the airport can be tricky, but a new feature on the TripIt from Concur app helps eliminate the guesswork. The Go Now feature, which is available to TripIt Pro members, suggests the best time to head to the airport for any US domestic flight based on your current location, the flight status, and the local traffic conditions. The departure info becomes available the day before your flight, and gets regularly updated until flight time. TripIt and Go Now work on Android and Apple devices. TripIt, which organizes all your travel plans in one place, is free, but a TripIt Pro annual subscription costs $49. www.tripit.com/pro. Put a GoPure Pod in your water bottle to create tasty drinking water when you travel, and help eliminate the use of plastic water bottles along the way. The tiny pod, made by Wilton, Conn.-based Bloc Enterprises, has a highly porous ceramic tube inside that adsorbs harmful bacteria and chemical impurities in drinking water. The pod removes minerals and chemicals that make the water taste bad and, as studies show, can impact our health. It also balances the pH in water and prevents it from growing stale. A harmless trace of silver within the pod keeps bacteria from forming on the ceramic tube, ensuring the tube’s surface remains clean and hygienic. Each pod lasts up to six months, treating up to 264 gallons of water. $24.95. gopurepod.com. Turn a single hotel or airport outlet into a charging station with iClever’s new BoostStrip IC-BS01. 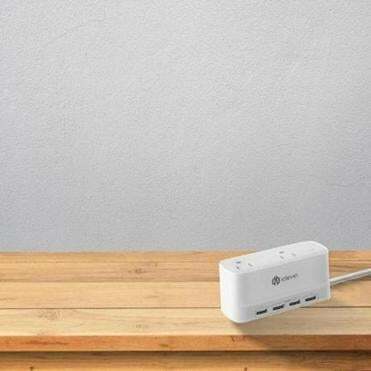 This portable power strip weighs just 11 ounces and comes with two three-prong outlets and four USB ports (12 watts/2.4 amps per port). The three-prong outlets offer surge and short-circuit protection to prevent your devices from getting damaged, and provide up to 1000 watts/10 amps. The power strip’s SmartID technology enables it to recognize maximum charging efficiency so it doesn’t overcharge your USB devices. It also comes with a handy 5.5-foot-long cord. Currently available for $20.99 at Amazon.com. www.iclever.com.